Also popular for some purposes have been sea urchins and ascidians. For studies of regeneration urodele amphibians such as the axolotl Ambystoma mexicanum are used, and also planarian worms such as Schmidtea mediterranea. Organoids have also been demonstrated as an efficient model for development. Plant development has focused on the thale cress Arabidopsis thaliana as a model organism. ^ Li B.; Carey M.; Workman J.L. (2007). "The role of chromatin during transcription". Cell. 128: 707–719. doi:10.1016/j.cell.2007.01.015. PMID 17320508. ^ Heintzman N.D.; et al. (2007). "Distinct and predictive chromatin signatures of transcriptional promoters and enhancers in the human genome". Nat Genet. 39: 311–318. doi:10.1038/ng1966. PMID 17277777. ^ Meinhardt H., Gierer A. (2000). "Pattern formation by local self-activation and lateral inhibition". BioEssays. 22: 753–760. doi:10.1002/1521-1878(200008)22:8<753::aid-bies9>3.0.co;2-z. ^ Sprinzak D.; et al. (2010). 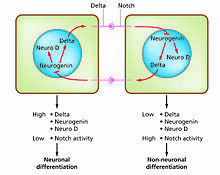 "Cis-interactions between Notch and Delta generate mutually exclusive signalling states". Nature. 465: 86–90. doi:10.1038/nature08959. ^ Carlson, B.M. (2007) Principles of Regenerative Biology. Academic Press, Burlington MA. ^ Bosch T.C.G. (2007). "Why polyps regenerate and we don't: Towards a cellular and molecular framework for Hydra regeneration". Developmental Biology. 303: 421–433. doi:10.1016/j.ydbio.2006.12.012. ^ Reddien P.W., Alvarado A.S. (2004). 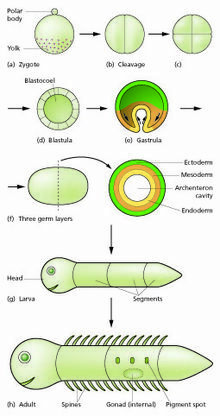 "Fundamentals of planarian regeneration". Annual Review of Cell and Developmental Biology. 20: 725–757. doi:10.1146/annurev.cellbio.20.010403.095114. PMID 15473858. ^ Wagner D.E. ; Wang I.E. ; Reddien P.W. (2011). "Clonogenic Neoblasts Are Pluripotent Adult Stem Cells That Underlie Planarian Regeneration". Science. 332: 811–816. doi:10.1126/science.1203983. ^ Nakamura T.; et al. (2008). "Dissecting insect leg regeneration through RNA interference". Cellular and Molecular Life Sciences. 65: 64–72. doi:10.1007/s00018-007-7432-0. ^ Simon A., Tanaka E.M. (2013). "Limb regeneration". Wiley Interdisciplinary Reviews-Developmental Biology. 2: 291–300. doi:10.1002/wdev.73. ^ Slack, J.M.W. (2013) Essential Developmental Biology. Chapter 20. Wiley-Blackwell, Oxford. ^ Jungnickel M.K. ; Sutton K.A. ; Florman H.M. (2003). "In the beginning: lessons from fertilization in mice and worms". Cell. 114: 401–404. ^ Kimelman D., Martin B.L. (2012). "Anterior-posterior patterning in early development: three strategies". Wiley Interdisciplinary Reviews-Developmental Biology. 1: 253–266. doi:10.1002/wdev.25. ^ Slack J.M.W. (1987). "Morphogenetic gradients - past and present". Trends in Biochemical Sciences. 12: 200–204. doi:10.1016/0968-0004(87)90094-6. ^ Rogers K. W., Schier A. F. (2011). "Morphogen Gradients: From Generation to Interpretation". Annual Review of Cell and Developmental Biology. 27: 377–407. doi:10.1146/annurev-cellbio-092910-154148. ^ Dahmann C.; Oates A. C.; Brand M. (2011). "Boundary formation and maintenance in tissue development". Nat Rev Genet. 12: 43–55. doi:10.1038/nrg2902. ^ Hardin J., Walston T. (2004). "Models of morphogenesis: the mechanisms and mechanics of cell rearrangement". Current Opinion in Genetics and Development. 14: 399–406. doi:10.1016/j.gde.2004.06.008. ^ Hammerschmidt M., Wedlich D. (2008). "Regulated adhesion as a driving force of gastrulation movements". Development. 135: 3625–3641. doi:10.1242/dev.015701. ^ Moss E.G., Romer-Seibert J. (2014). "Cell-intrinsic timing in animal development". Wiley Interdisciplinary Reviews-Developmental Biology. 3: 365–377. doi:10.1002/wdev.145. ^ Tata J.R. (1996). "Amphibian metamorphosis: an exquisite model for hormonal regulation of postembryonic development in vertebrates". Dev. Growth Diffn. 38: 223–231. doi:10.1046/j.1440-169x.1996.t01-2-00001.x. ^ Brown D.D., Cai L. (2007). "Amphibian metamorphosis". Developmental Biology. 306: 20–33. doi:10.1016/j.ydbio.2007.03.021. ^ Maves L., Schubiger G. (2003). "Transdetermination in Drosophila imaginal discs: a model for understanding pluripotency and selector gene maintenance". Current Opinion in Genetics & Development. 13: 472–479. doi:10.1016/j.gde.2003.08.006. ^ Bäurle, I; Laux, T (2003). "Apical meristems: The plant's fountain of youth". BioEssays. 25 (10): 961–70. doi:10.1002/bies.10341. PMID 14505363. Review. ^ Leopold, A. C. Plant Growth and Development, page 183. (New York: McGraw-Hill, 1964). ^ Brand, U; Hobe, M; Simon, R (2001). "Functional domains in plant shoot meristems". BioEssays. 23 (2): 134–41. doi:10.1002/1521-1878(200102)23:2<134::AID-BIES1020>3.0.CO;2-3. PMID 11169586. Review. ^ Barlow, P (2005). "Patterned cell determination in a plant tissue: The secondary phloem of trees". BioEssays. 27 (5): 533–41. doi:10.1002/bies.20214. PMID 15832381. ^ Ross, S.D. ; Pharis, R.P. ; Binder, W.D. 1983. Growth regulators and conifers: their physiology and potential uses in forestry. p. 35–78 in Nickell, L.G. (Ed. ), Plant growth regulating chemicals. Vol. 2, CRC Press, Boca Raton FL. ^ Nieuwkoop, P.D. and Faber, J. (1967) Normal table of Xenopus laevis (Daudin). North-Holland, Amsterdam. ^ Harland R.M., Grainger R.M. (2011). "Xenopus research: metamorphosed by genetics and genomics". Trends in Genetics. 27: 507–515. doi:10.1016/j.tig.2011.08.003. PMC 3601910 . PMID 21963197. ^ Lawson N. D., Wolfe S. A. (2011). "Forward and Reverse Genetic Approaches for the Analysis of Vertebrate Development in the Zebrafish". 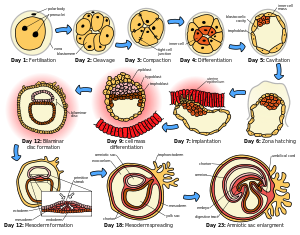 Developmental Cell. 21: 48–64. doi:10.1016/j.devcel.2011.06.007. ^ Hassan Rashidi V.S. (2009). "The chick embryo: hatching a model for contemporary biomedical research". BioEssays. 31: 459–465. doi:10.1002/bies.200800168. ^ Behringer, R., Gertsenstein, M, Vintersten, K. and Nagy, M. (2014) Manipulating the Mouse Embryo. A Laboratory Manual, Fourth Edition. Cold Spring Harbor, NY: Cold Spring Harbor Laboratory Press. ^ St Johnston D (2002). "The art and design of genetic screens: Drosophila melanogaster". Nat Rev Genet. 3: 176–188. doi:10.1038/nrg751. PMID 11972155. ^ Riddle, D.L., Blumenthal, T., Meyer, B.J. and Priess, J.R. (1997) C.elegans II. Cold Spring Harbor Laboratory Press, Cold Spring Harbor, NY. ^ Ettensohn C.A., Sweet H.C. (2000). "Patterning the early sea urchin embryo". Curr. Top. Dev. Biol. 50: 1–44. ^ Lemaire P (2011). "Evolutionary crossroads in developmental biology: the tunicates". Development. 138: 2143–2152. doi:10.1242/dev.048975. ^ Nacu E., Tanaka E.M. (2011). "Limb Regeneration: A New Development?". Annual Review of Cell and Developmental Biology. 27: 409–440. doi:10.1146/annurev-cellbio-092910-154115. ^ Ader M., Tanaka E. M. (2014). "Modeling human development in 3D culture". Current Opinion in Cell Biology. 31: 23–28. doi:10.1016/j.ceb.2014.06.013. ^ Weigel, D. and Glazebrook, J. (2002) Arabidopsis. A Laboratory Manual. Cold Spring Harbor Laboratory Press, Cold Spring Harbor, NY. This page was last modified on 2 January 2017, at 14:59.